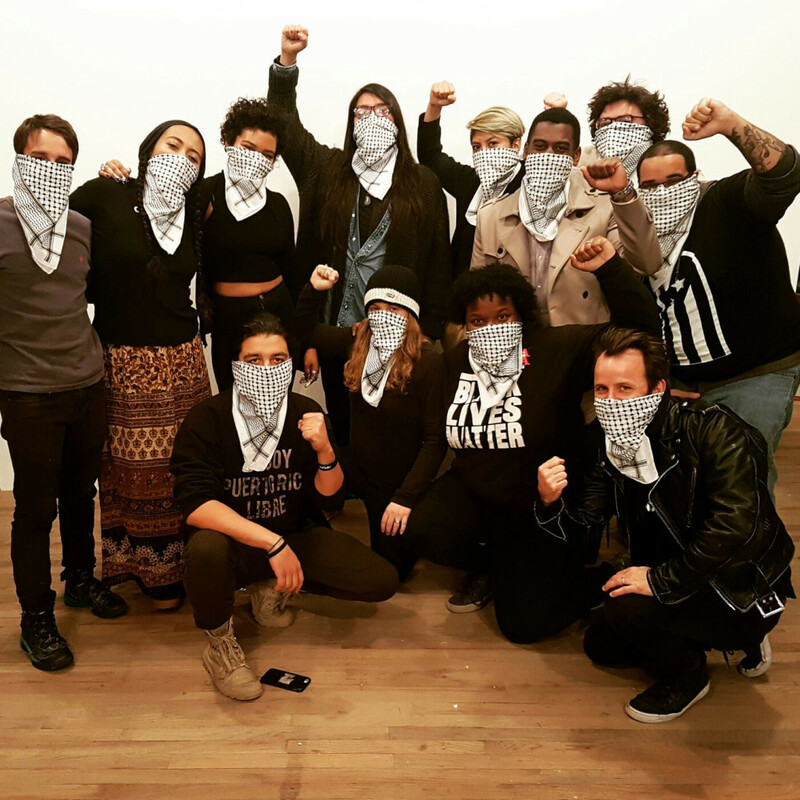 For three months in the fall of 2016, the Decolonize This Place residency at Artists Space functioned as a headquarters and meeting place for artists and organizers from across New York City, each of whom were tied to decolonial struggles at national and global scales. 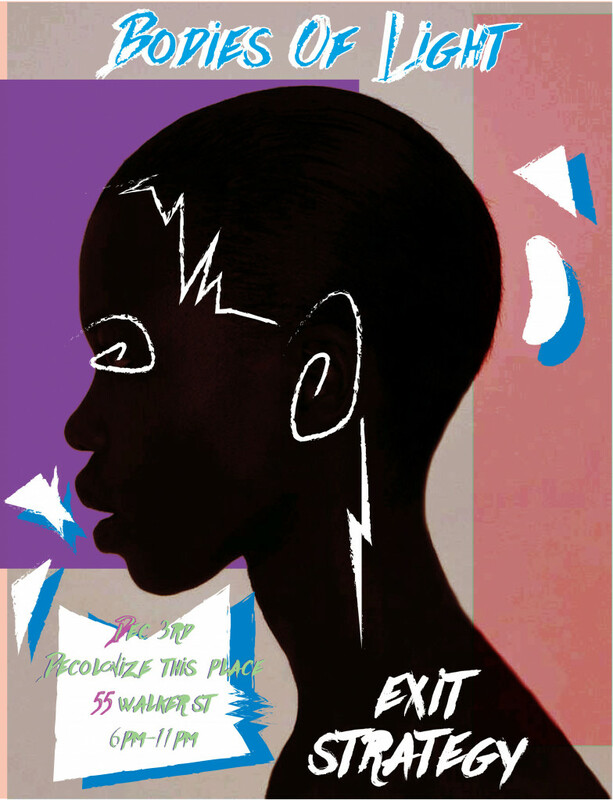 As part of the series 2016: The Year According to, the residency’s artist-organizers share this look at the countless actions and groups that were woven into the project, creating a dynamic aesthetic and political environment whose signature characteristic was a decentering of whiteness and an abundant production of movement art moving back and forth between the street and the space and back again. The process was facilitated by a core group called MTL+. The Standing Rock rebellion against the Dakota Access Pipeline builds on centuries of resistance, and has bravely endured in the face of state terror against the encampment. The Water Protectors have made it clear that any political action must begin by acknowledging that we stand on occupied indigenous territory, and that decolonization must be our ultimate horizon. Teach-ins, rallies, benefit concerts, and delegations to North Dakota proliferated in New York, which also witnessed an action entitled Decolonize This Museum. 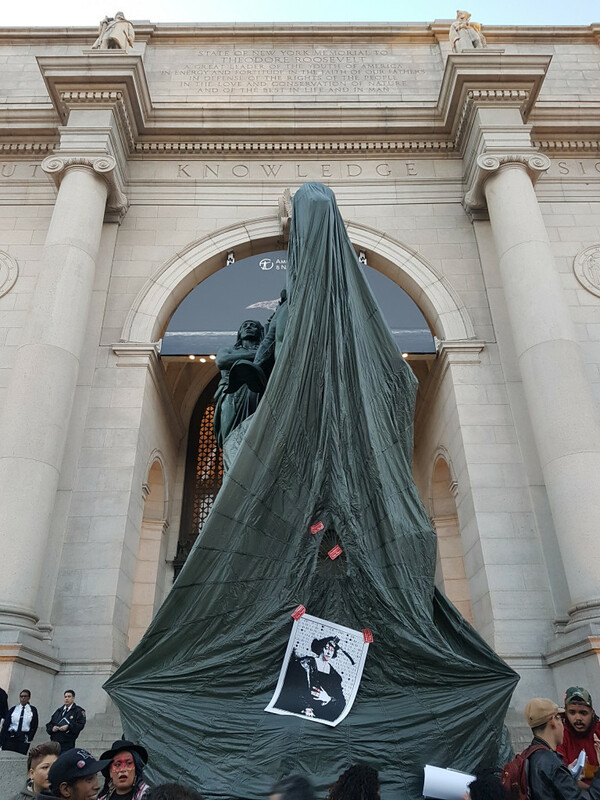 Inspired by a 2015 “counter-tour” led by Black Lives Matter activists of the racist premises of the American Museum of Natural History (including the statue of Teddy Roosevelt flanked by a black man and a Native American out front), a coalition of groups led by NYC Stands With Standing Rock and Decolonize This Place descended onto the museum with a crowd of three hundred on Columbus Day, issuing three demands: remove the Roosevelt statue, scrap the racist curatorial frame of the “ethnographic halls,” and follow other US cities in abolishing Columbus Day and renaming it “Indigenous People’s Day.” To prefigure the removal of the statue, activist draped it in a funerary shroud. Negotiations with the museum are ongoing as this goes to press. Over the summer, decolonial activists in Puerto Rico devised a new symbol of resistance to PROMESA, the draconian fiscal control board imposed on the debt-bonded island: they translated the Puerto Rican flag into a stark black and white design, first enacting it on the iconic landmark “Door of San Juan” in the island’s capital city. The blackening of the Puerto Rican flag was a sign of both mourning and for the increasingly stark antagonism between the people and the colonial powers of the US. But it was also an echo of the same procedure used by black and Latin(x) activists in the United States relative relative to the US flag. 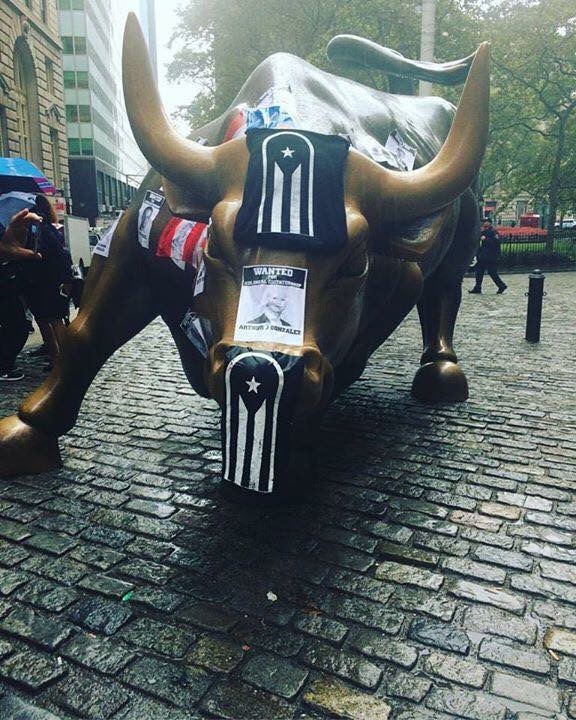 The revised flag has in turn been taken up by PR activists in the US such as Comite Boricua en La Diaspora, with the insignia now appearing in demonstrations in the form of stickers, buttons, banners—and a mural in Spanish Harlem that mirrors the one in San Juan. 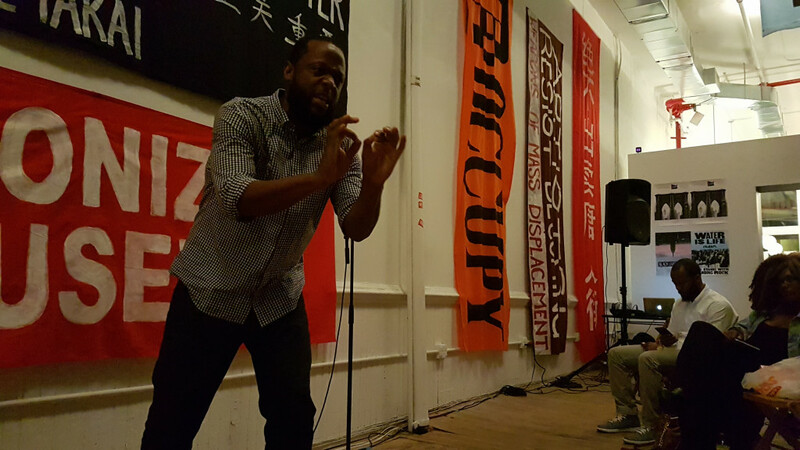 Launched by artist Jive Poetic, this roving network of writers, performers, and spoken word artists creates spaces that are at once social, political, and aesthetic. Insurgents Poet’s Society (IPS) exists to build and maintain diverse poetic platforms that neither alienates nor excludes people of color. 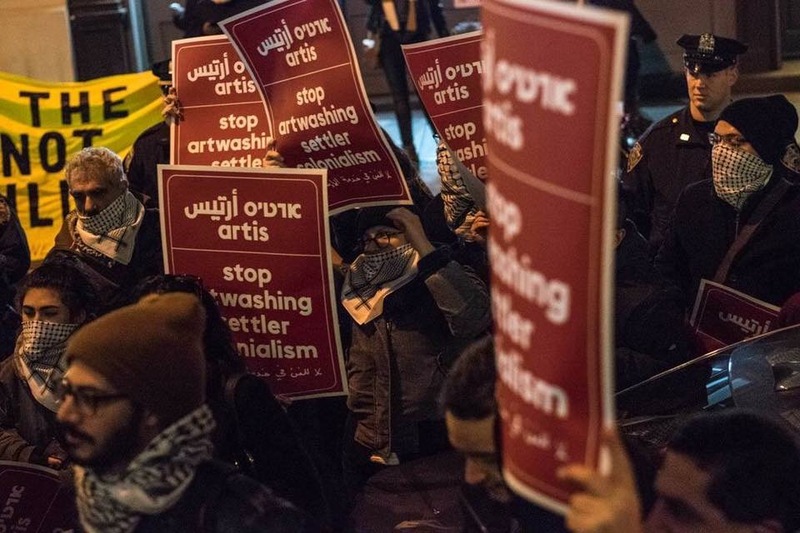 The programs and actions that the group facilitates are intended to infiltrate and disrupt artistic segregation that has been standardized by the literary and performance worlds. In their words, “We do not wish to have our voices fill racial quotas or alleviate white guilt; because of this, we resist and reject false gestures of inclusion that reduce our voices to seasonal ornaments that are only displayed during specific heritage month celebrations. Our work is to position marginalized and oppressed voices as tools to engage culturally, emotionally, socially, and politically. 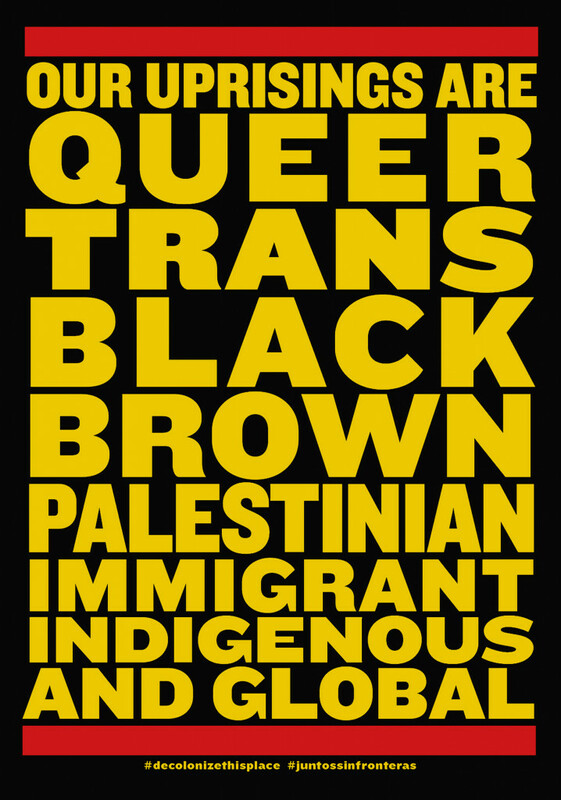 We write and perform acts of resistance while collecting and redistributing resources for survival.” El Salon shares the mandate of IPS to create spaces that decenter whiteness in the field of cultural production, and enable the flourishing and sharing of radical voices of color. El Salon also involves a crucial ingredient in the building of community: making and enjoying food together as new people step up to present their work. Based in Buffalo but sustaining long-term ties to NYC, this POC-led art collective first staged their Exit Strategy performance party at the autonomous Dreamland Space this November as a response to the political crisis of the Trump victory—though members of the collective would be quick to point out that the state of emergency that has shocked so many liberal white folks in the arts and otherwise was already regular state of affairs for black and brown people. A second iteration of the project was made in New York with the title Bodies of Light encompassing a multivocal assemblage of poetry, song, MCing, and dance, accompanied by a beautiful series of photographic portraits of dozens of artists of color in the orbit of the collective by Rhys Hall and Paris Henderson. The phrase “bodies of light” evokes the medium of photography, as well as the aura surrounding each individual that becomes visible under conditions of psilocybin-induced hallucination or a mystical trance. In this groups’ work, the darkness of melanin glows bright, burning through the color-blindness of the white cube. 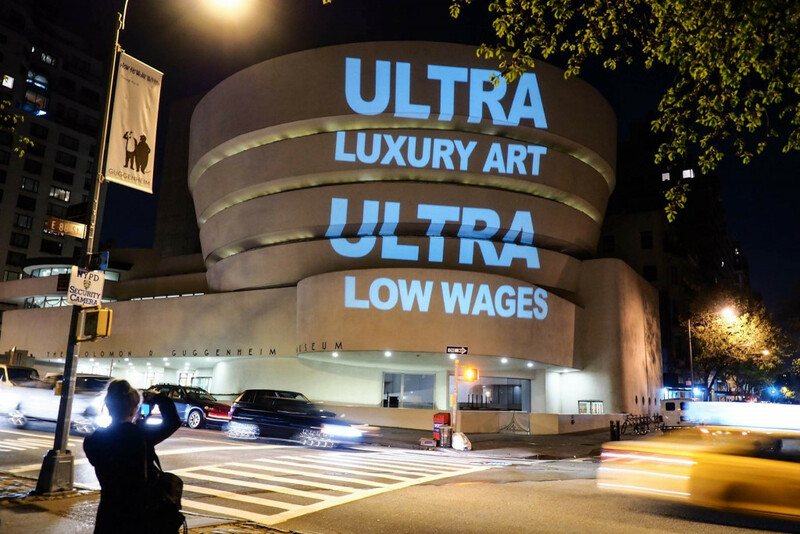 In late April—just prior to the one-year anniversary of the historic May Day occupation of the museum—the iconic facade of the Guggenheim was once again illuminated by GULF, the direct action wing of the Gulf Labor campaign that for the past seven years been pressuring the institution to redress the abhorrent working and housing conditions of the thousands of debt-bonded South Asian migrant laborers who toil on the construction sites of Saadiyat (“happiness”) Island. Guggenheim director Richard Armstrong had recently announced it would no longer negotiate with Gulf Labor, and for the first time, GULF now moved to target the board of trustees, signaled by an animated graphic wherein a smiling Armstrong multiplies into a many-headed creature reminiscent of the Hindu demon-god Ravana featuring each of the trustees (including board president William Mack, whose own home on Park Avenue was also given the Illuminator treatment). Since breaking off talks, the Guggenheim has shamelessly plowed ahead with the project, ignoring the work of a coalition of global labor experts who have positively assessed the demands of Gulf Labor, as well as adjusting to the threat of reputational damage in the art world—a sobering lesson about the limits of single-issue rights-based campaigns in the artworld and otherwise. On November 20, 2014, 28-year-old black man Akai Gurley was shot by NYPD officer Peter Liang in the stairway of his NYCHA building in East New York. Earlier this year, Liang was charged with “negligent homicide” and sentenced to 800 hours of community service—a stark reminder that even when prosecuted, police are basically above the law and can take black lives with impunity. Since Gurley’s death, his family members have joined with the families of other victims of NYPD murder in recent years, like Kimani Gray, Shantal Davis, Nicholas Heyward Jr, and Michael Ferguson, to form a network of mutual support and advocacy. 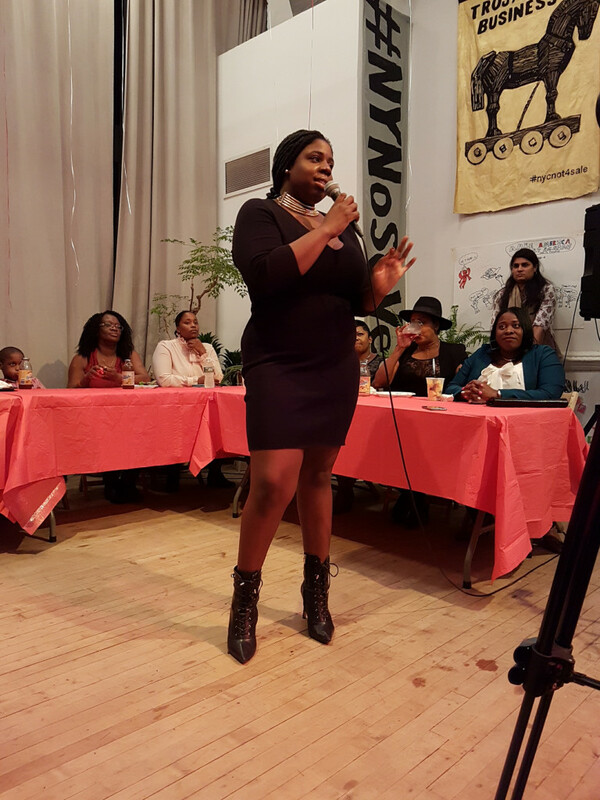 On the two-year anniversary of the killing, the families gathered for a potluck dinner and testimonial, mixing a sense of convivial festivity with the militancy and mourning that has fueled black liberation movements since the times of slavery. Movements need to move—that is, they must grow in response to a changing strategic landscape, but they must also touch and animate our minds, bodies, and emotions. Song is essential to this process, and Mahina Movement, headed up by Lorena Ambrosio, Moana Litia Makakaufaki Niumeitolu, and Gabstar Cal, brought their sweet sounds to actions in New York City and beyond throughout 2016. Intermingling their Latina and South Pacific heritages as well as an abiding connection to Palestine, Mahina incorporates ritual, poetry, and gestural movement into their music. 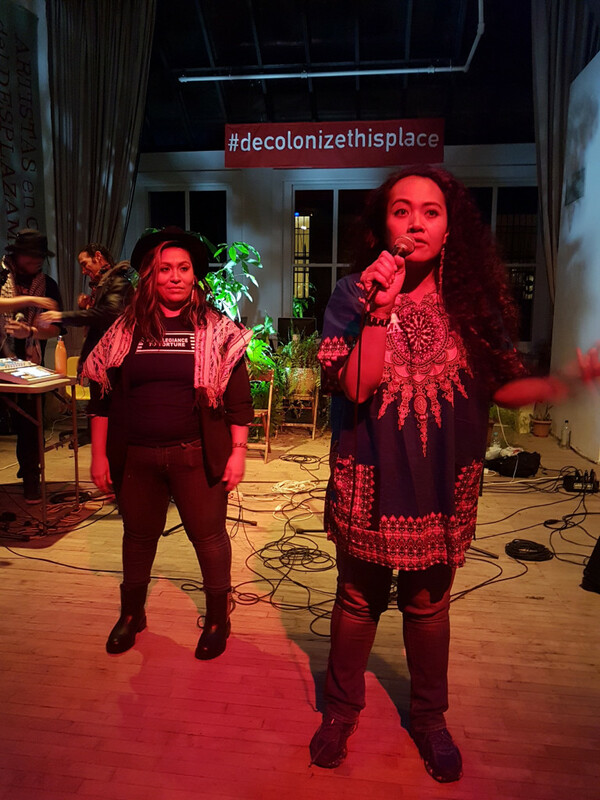 The group maps out a soundscape of decolonial solidarity that spans the globe and reaches back into the deep time of indigenous resistance and women’s warriorhood. As the dark times of the past 500 years become even darker with the coming of Trump, Mahina’s sounds of love and rage will be an essential resource of spiritual and bodily survival, recalling Audre Lorde’s maxim that “art is not a luxury.” An album of songs for Palestine will be released early in the New Year. Having demonstrated how to begin the process of decentring whiteness, rearranging power, and repurposing the infrastructure of an art institution, Decolonize This Place set a model that other institutions felt compelled to emulate with the coming of the Trump regime. 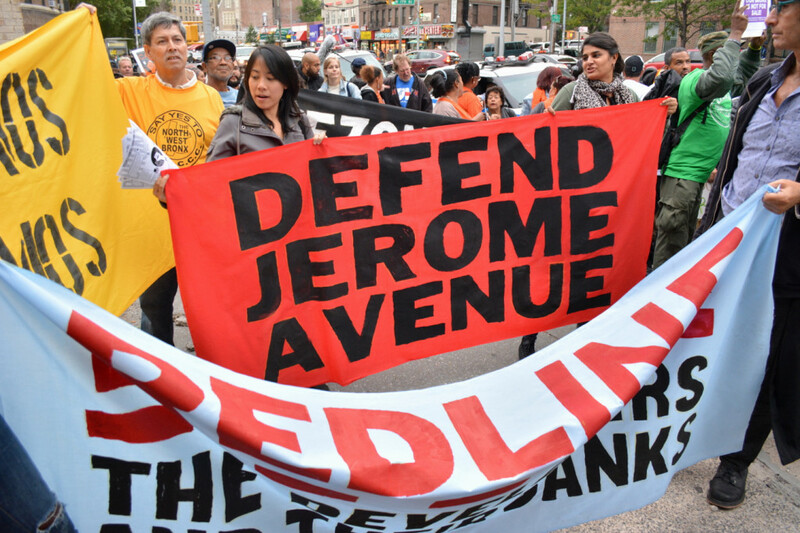 This quickly gave rise to a Decolonize This Place network with hubs in all five boroughs, rechanneling art world resources into a commons-based solidarity economy and led at a local level by artists and organizers from the neighborhood. Collective care, communal, self-defense, and land-liberation at every level was the priority of the network. The people were becoming ungovernable.